It is time to tap dance on landmines and begin the Gun Facts investigation of the intersection of mental health and gun violence. This will be an ongoing project, as it appears to be a determinant variable in mass homicides (and hence, mass shootings). Three forms of mental impairment are tightly associated with spree and serial killers. 74% of mass shooters had some form of genetic or induced disorder. In-patient psychiatric care was replaced, in part, with psychotropic medications, some of which can amplify violent desires. 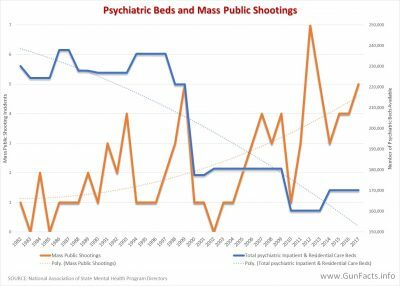 News reports too often detail that mass public shooters had prior histories of mental health issues. One need only look at some of the twenty-first century’s mass murderers (the rogues galley at right being a representative sample) and you can tell there is something fundamentally different and dangerous about them. But numbers matter, and here is where an odd source helps. In the aftermath of the Sandy Hook Massacre, which was carried out by one of the lunatics pictured here, Mother Jones began to compile a list of mass public shootings. Much to their credit, they investigated if the shooters had any mental health issues before the event. NOTE: Mother Jones culled their list from news reports. 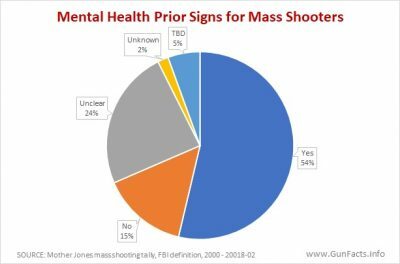 Reporters may not have investigated the mental health angle for any given event, and thus the Mother Jones tally of mental illness in mass public shooters is likely low. Their accounting for this century shows a minimum of 54% of mass and spree killers having prior histories of mental health issues. By any standard, this is a determinant variable. That in a full 26% or more of the instances reporters cannot make a determination of the mental health history of the shooter means we have a range of 54–80% of these mass murders having one or more screws loose. What is the cause of their conditions? Why were they not put into treatment? If put into treatment, why did it not work? What policy makes sense going forward? None of these questions have easy answers, but there is data to help guide investigation. My friends in the mental health fields hate it when I say this, but we are discussing brains that do not work correctly. We all have personality quirks (and if you don’t believe this, ask your spouse – they will give you a vivid description of yours). And we all get depressed from time to time. But these are not signs of a dysfunctional brain, just life and marginal variations from the norm. For the average Joe, we are sane enough to never want to kill anyone, even those who wrong us. With mass public shooters, we see major disconnections from reality that lead to mass murder appearing to them as optional and perhaps desirable. The question is what might cause this. When I started digging, I saw that many medical researchers had taken tiny steps into the field. One paper, Neurodevelopmental and Psychosocial Risk Factors in Serial Killers and Mass Murderers, was a “review of literature,” a term that means the authors read and distilled a bunch of other academic papers. This was a good starting point and a real eye opener into some of the aspects of mental disorder and mass homicide. 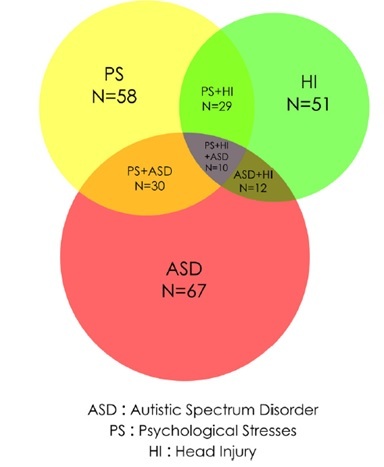 Shooters within Autistic Spectrum Disorder (ASD) were the most common. People with psychological stresses (and psychosocial stressors) were marginally second most frequent. Those with head injuries were almost as frequent as group #2. In all, 74% of mass shooters had some form of genetic or induced disorder, which is in the same range as what Mother Jones concluded (54–80%). Naturally, some shooters have two or all three of these maladies. Here is an important detail. People with ASD make up about 1% of the population and over 28% of mass murderers, as tallied by this paper. And the latter number is likely low because these are just the cases that could be reported. Medical privacy laws do not allow open source investigations into the personal backgrounds of homicidal maniacs. This may be a moot point because this disparity – 1% of the population linked to 28+% of mass murders – is, statistically speaking, not ignorable. This does not mean everyone with ASD will be a murderer. But it is now a primary early warning indicator for mental health professionals to watch. But so too are people with medical histories of head injuries and childhood stressors. One of the legislative problems to be faced is when a medical professional should recommend institutionalization (more on that later). It is the result of a cognitive appraisal (your mental interpretation) of what is at stake and what can be done about it. More simply put, psychosocial stress results when we look at a perceived social threat in our lives (real or even imagined) and discern that it may require resources we don’t have. One study 1 found boys on the high-functioning end of the autism spectrum to be measurably more susceptible to irritability when exposed to physiological stressors, to the point of impairment. In the United States, we chose to not treat all the mentally ill in institutions. In the psych trade, this was called deinstitutionalization. 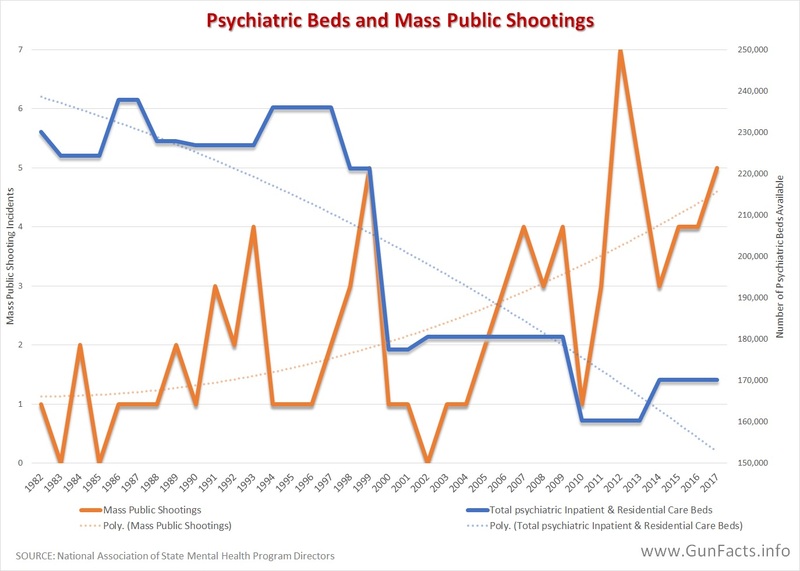 There were a few good reasons to reduce the number of psych beds, some reasons that had unintended side effects, and other reasons that were a case of government short-sightedness. New drugs were developed which let the truly psychotic live more-or-less normal lives. Social Security Disability gave them a means of support. Some truly horrible institutions painted a bad public picture of psychiatric institutions. Governments wanted to slash costs and started shutting down institutions, moving patients to “community based” programs. One possible side effect is that people who showed (a) unpredictable behavior and (b) made threats of violence were no longer sent to a psych hospital for evaluation, but instead treated in a hodgepodge of community outpatient situations. Often the “community” treatment failed to identify the underlying source of the threatening behavior and instead relied on psychotropic medications (more on this in a bit). 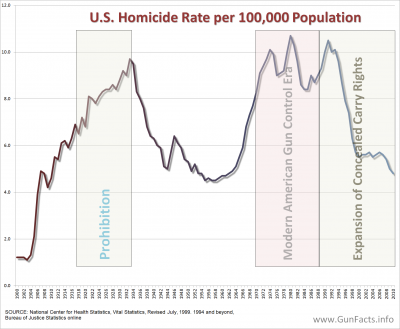 NOTE: Gun Facts researchers are working to compile a timeline of the percentage of the American population taking psychotropic medications, and we will update this blog once the data is available. We Americans like our drugs. And from close-up observations of honkytonk cowboys on a Saturday night, we might consider putting Jack Daniels on the Schedule 1 list of dangerous narcotics. In the panacea of mind-bending chemicals is a slate of medications designed to control chemical balances in the brain. I do not decry these drugs – they are very important for some people. But they are completely unnecessary for others. Yet, doctors over-prescribe them (a former girlfriend of mine was prescribed Prozac for her PMS symptoms – thankfully she tossed the pills). These patients are often unreliable, and do not always take their meds, or withdraw from the meds in an uncontrolled way. Side effects, especially during uncontrolled withdrawal, are known to induce many symptoms that may be associated with spree killing. The two classes of medications most commonly at play are antidepressants and antipsychotics. The second group, antipsychotics, is of interest because two of these medications are routinely prescribed for autism patients, which we saw above are the primary psychological risk factor in spree killings. What needs consideration is if we are moving at-risk people from an “unhappy but harmless” condition to a “psychotic and dangerous” condition through either unnecessary medications or through unsupervised withdrawals. The latter is most compelling when you consider the combined effects of deinstitutionalization (closing of mental health facilities) and increased medication use. Applying psychotropic drugs to fringe patients without constant supervision likely increases the number of people ready to shoot up schools and movie theaters. We can begin unraveling this mess by better understanding all the risk factors. We need to make the medical records – diagnosis, treatments, medications – open source so researchers can begin finding clusters of influences for mass murder. Until this happens, we do not fully understand the situation. A Facebook conversation on this article brought up the reality that most criminal violence is committed by men. No argument there. But that got us to remember that Autism is majorly associated with boys, with autism appearing in boys four times a frequently as girls. One report, albeit a little old, also mentions that regulating of “threat detector” centers in the brain is associated with autism. Recognising the over representation of autistic males in mass murder tallies, and seeing how perception of threat merged with psychosocial stressors is a key factor as well, and making a wild assumption about stressors feeding an unregulated threat-detector in the brain, we may have an interesting situation to ask forensic teams to assess. Medical privacy laws prevent us from learning more. An area that you must include in your investigation is violent gaming and violence in the media, and how long term exposure affects children, especially those identified above. See books written by Lt. Col. Dave Grossman. I intend to look into this. From a different study of mass murderers (one exploring the relevance of the “warrior gene”) we know that prepubescent exposure to graphic violence in the real world is one of the factors. I have a hunch that graphic game violence could be a substitute. Thanks. Going to repost this on my facebook as I think it was squashed when I put it up on the 3rd. Thank you for taking on the controversial subject of psychotropic drugs, their effect on dangerous people, and the lack of institutional supervision for those who need it. I am going to suggest an avenue of investigation. In the past did we have fewer people suffering these disorders, or were they just better controlled? I believe the latter. A key difference over the last 30 to 40 years is more permissive parenting, particularly at younger ages. Children do not learn that inappropriate behaviors have consequences… consequences they don’t like. It is imperative to learn this *before* the illness manifests. While this is important for all children, I think it may be so much more so for those with impaired moral judgment. If they learn there are unsavory consequences for doing things they are told not to do, even if they don’t recognize it as “wrong”, they will refrain because they will view the consequences of their actions as a form of “self-injury”. Is it 100% effective? Obviously not, but it does provide an alternative reason for self control in many. Having grown up in one generation, and raised children in the other, this seems obvious to me, where perhaps it may not to those who are product of, and were not harmed by permissive parenting. The problem is, they cannot perceive the harm it does to those who have a warped social conscience. Well written piece on this important issue. I definitely encourage you to stick a pitchfork deep into this issue of mental illness, psychotropic medications, deinstitutionalization and also please include broken and dysfunctional family units, specifically fatherlessness. I believe only one single mass shooter in the past quarter century was raised with their own biological father being present in the home. It’s important to keep in mind that all this attention is aimed at “preventing tragedies before they occur.” That’s important work, but it’s imperative to keep in mind that this should not be our only approach, because not only will we never see perfection here, we will never even get close to it. If society aimed solely at preventing automobile accidents or fires from occurring, we would never have invented airbags, smoke detectors, or sprinkler systems, strategies that save an immense number of lives that fall through the first sieve. Just as engineers have asked themselves how best to ameliorate the consequences of auto accidents or fires *after they have already begun,* we need to make sure society pays attention to this same question with respect to mass murderers. And we all know the answer: stop violating the human rights of victims and bystanders by depriving them of their means of self-defense. We need to insist on this, and we need in an organized fashion to begin slapping down the crybullies who scream that this solution is somehow unthinkable.